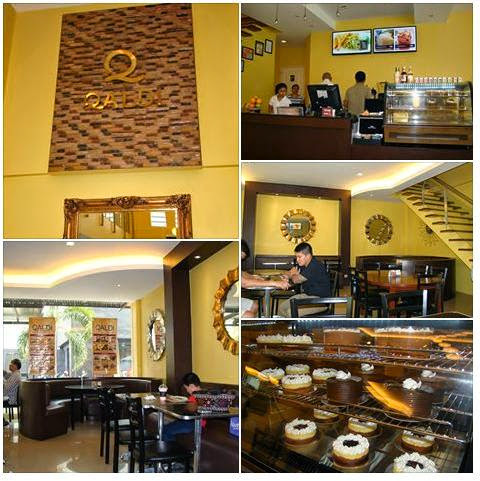 Qaldi Coffee Bar and Cyber Café opened in November 2013. Joon Tianzon and his partners love coffee and hence they decided to open up a coffee shop. 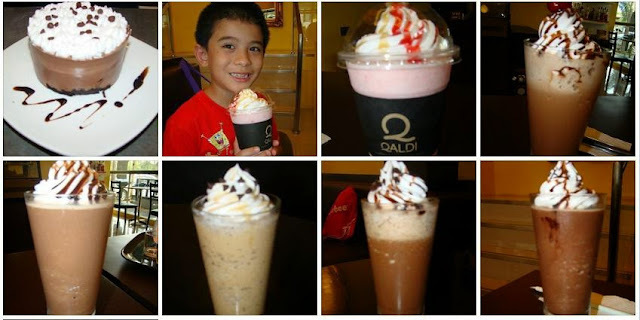 Qaldi gets its name from the Ethiopian, Kaldi, who discovered the coffee beans. I like the Qaldi ambience---a warm, elegant, medium place that can seat a lot of people. Whether you are looking for a quick meal, a romantic dinner a relaxed environment to chum with friends or just in the mood for some coffee, Qaldi is the best place to go. Aside from wide array of coffee and frappes, Qaldi also offers a varied selection of imported premium teas from Sri Lanka, India etc. And for a start-up café, I have to say that their menu is quite extensive. 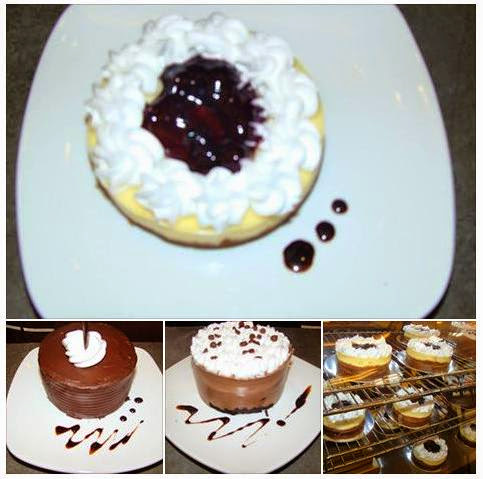 They have sandwiches, pasta, and desserts to pair up with tea, coffee or fruit concoctions. If you’re a sandwich lover, you’ll love to know that Qaldi clubhouse servings are hefty and good for sharing. 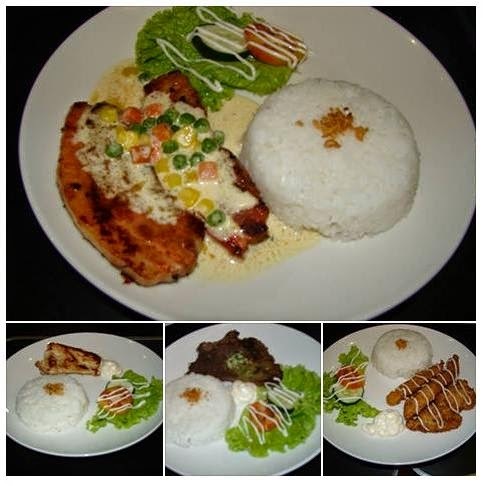 They even serve rice meals that are perfect for breakfast, lunch or dinner. Served hot from the grill, the ham and cheese filling inside the wheat bread comes out perfectly well. It comes with homemade potato chips on the side. The classic tuna spread comes with cucumbers and fresh lettuce leaves. The potato chips adds flavor to the creamy mayo filling. Qaldi alternates cheese, cornbeef , lettuce leaves, ham and egg in its Reuben Clubhouse Sandwich offering. Chicken clubhouse sandwich comes in a fairly large serving of wheat bread, chicken breast bits with mayonnaise, scrambled egg , ham, lettuce and cucumber. I love its classic flavor. I highly recommend Seafood Marinara Pasta. This pasta dish is amazing! I couldn't stop eating it! I so love the flavors coming from prawns , bell pepper , tomatoes, meat and Parmesan cheese! The garlic wheat bread slices comes in perfectly as well. Classic pesto is pretty appealing and delicious as well. . The pesto is not overpowering and not that oily. This is exactly the pesto I am looking for! Super fresh and flavorful! The carbonara pesto is very tasty. Its creamy and thick sauce makes it great. There are sliced button mushrooms, ham and tomato bits spread on top to further enhance flavors. The Sweet style tomato pasta tastes like the Filipino spaghetti which kids would love to indulge in. Its sweet tomato sauce, cheese and hotdogs will surely appeal to those who prefer sweet pasta. This Greek-seasoned pork meat is tender and juicy. Greek oregano, garlic, and black pepper on the boneless pork sirloin chops gives it a distinct aroma. Go visit Qaldi for a hefty meal and a refreshing drink! Thank you Sir Jan. Hopefully as time goes by, we can open until wee hours of the morning! We are currently studying the possibilities! Again, thank you very much for coming back to Qaldi.